Once the reserve of superheroes, an exoskeleton suit is now in development to protect industrial workers. Prof Dr Ing Hans Wernher van de Venn, coordinator of the Robo-Mate project, explains. What is often not mentioned today, however, is that despite all the modern technology available there are still many production tasks that are difficult to automate and could not be accomplished without human involvement. These include small scale series productions, customer specific mass productions and the disassembly of serial products; for example, in motor vehicle recycling. Such work processes often take place in unstructured environments and require special human capabilities, such as practised hand eye coordination and other cognitive skills. Since such production and assembly processes are rarely supported by machines, they often demand extreme physical effort and/or occur in spaces that take a heavy toll on workers’ bodies. Due to this high level of stress, many people suffer from musculoskeletal diseases, which in turn increase costs and reduce productivity for companies. The objective of the Robo-Mate research project, started in September 2013, is to significantly simplify and partially automate activities for workers. An intelligent system would combine human precision and technical strength in a flexible exoskeleton, thereby offering what could be called the optimum symbiosis of man and machine. The criterion for this is a fundamental understanding of the anatomy, motor skills, perception and information processing of humans and their support through technical systems. Studies show that 44 million workers in the European Union suffer from work related musculoskeletal diseases. This costs the European economy more than 240 billion euros annually. The main causes are very physically demanding work, such as lifting heavy loads and manual assembly steps in industrial production processes. Sick leave, reduced productivity and high costs not only harm employees and companies, but society in general is also affected. There are already technological approaches available today that increase the efficiency and productivity of manual labour in industrial settings, from fully automatic industrial robots to simple cooperative systems between humans and machines. Systems that offer ergonomic advantages for employees are also being used more widely, but such devices do not offer any active help for lifting heavy loads, and thus are not deemed long term or labour saving solutions for employees. A new type of robot that can assist humans in challenging and hard to automate tasks must be capable of adapting, intuitive to operate, and above all, safe to use in every situation. Since September 2013, a European consortium of 12 partners from seven countries has been involved in the development of an innovative solution for the problem described previously. Well known representatives from industry and business are participating in the research and development of an intelligent symbiosis between man and machine. The consortium is a merger of leading industrial companies and research bodies from complementary fields. The resulting multidisciplinarity and diversified knowledge will enable the development of a unique system that is an ideal fusion of the strengths of both humans and machines. The exoskeleton aims to relieve the strain on employees in an industrial setting, especially in the motor vehicle and disassembly industries. The three year project is receiving funding of around 4.5 million euros from the European Union’s Framework Programme for Research (FP7). Whereas today’s research groups mainly focus on the possibilities of artificial intelligence as the key to interaction between humans and robots, this new project is different. The key in this case is not found by using calculations and algorithms to recreate human intelligence so that the ‘user’ of the robot can communicate with it almost exactly as with a human. The aim of this project is rather to combine the specific strengths of machines and humans as optimally as possible. The researchers want to use the capability of technical systems, primarily to perceive movements and forces via sensors. 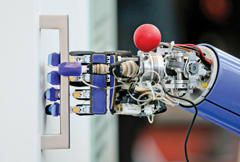 The user should also be in a position to control the movements of the robot without having to programme it explicitly. Similar to how tactile perception is the first sense that humans use to perceive themselves and their environment, the robot should be able to communicate with humans using an interface that can be controlled intuitively. In several previous studies the robotics research group at the Zurich University of Applied Sciences (ZHAW) Institute of Mechatronic Systems has already proven that such interaction is possible; for example, in conventional industrial robots equipped with force sensors. In addition to their high lifting capacity and positioning precision, this allows for the robots to be guided more or less by the user’s little finger. The current project follows this principle from the outset. Humans make use of their pronounced cognitive and visual abilities, while robots contribute strength, precision and endurance. In the planned exoskeleton, human and robot seemingly fuse into one unit as the user wears the robot on their body. In this scenario, humans and robots become closer than ever before. The project may sound like a science fiction movie, in which humans become super beings with the help of machines. Scepticism is certainly called for as, naturally, there are safety risks associated with the enormous strength of the machine. In order to develop a realistic solution for industrial users there are ergonomic and safety experts involved in the project, along with technical experts from the field of human-robot collaboration. At the centre of this project lies the question of how the different technical requirements can be harmonised with the needs of users, in order to provide a solution that will reduce and simplify physical labour without causing new problems. The current project consists primarily of an artificial exoskeleton, which serves as an exterior support structure. The outer skeleton should make physically demanding tasks easier and contribute to increased safety and productivity. Lifting heavy loads, working in overhead positions and assembling or disassembling structural components will become easier, reducing the stress on workers. Similar robotic systems are already being used successfully in military and rehabilitation settings, but the current design hopes to be more flexible than the existing systems, thus presenting a unique solution for improving manual production processes in an industrial environment. With its easy technical adaptability, the exoskeleton will offer tremendous potential for deployment. It could be used in industries including logistics, food, aviation, textiles and automotive. The robot system will consist of a fully movable and extremely flexible upper body. Protective brackets will be attached to protect and relieve the neck and back muscles. To enable the user’s unobstructed movement a minimum of 20 degrees of freedom are planned, excluding the hand, with three in the shoulder joints alone and two each in the elbows and wrists. Since at least one gear is required for each of these degrees of freedom, developing the system poses a great challenge. The gears employed must be capable of achieving high speeds similar to those of the rapid movement of human limbs, but with significantly higher strengths. In order to prevent the exoskeleton from adding extra weight to the user, the engineers need to take advantage of cutting edge materials and gear technology available when choosing the gears and structural components. The lower body has a primarily supportive and lifting function and therefore requires significantly fewer gear-driven joints than the upper body. It allows the user to move as freely as possible and transfers the weight of the entire system to the floor, so that loads of up to 35kg can be lifted effortlessly. The user should be able to put on the exoskeleton, which can be adapted, unassisted, between heights of 1.6m and 1.8m. The suit should not restrict the user’s freedom of movement or normal work activities. A safety cable is used for support during lifting tasks and to supply electricity. A helmet with a built-in screen and headset is planned. This will allow incorporation of intelligent control programmes that have object and hazardous material recognition. Intelligent sensors will recognise and interpret the movements of the user and react appropriately according to the situation. The project represents innovation that has never been seen before in the context of industrial robots for worker protection. Thanks to its flexible exterior, the intelligent interaction between human and machine, and its easy operation, the exoskeleton is hoped to make a tremendous contribution to advancing the scope of application of industrial robots. The research component of the project and its implementation are setting complex tasks for the partners. Close cooperation between the various sectors and industry is a prerequisite of the development of this system and its application. In order to guarantee the functionality and deployment of the exoskeleton, a great number of mechatronic and ergonomic aspects must be taken into consideration. For this reason, the life of the project has been divided into different work stages and sub-projects. After the concept is defined and the technical and ergonomic system is established, the prototypes of all the sub-systems such as arms, legs, back and hands will be developed. The Fraunhofer Institute of Industrial Engineering (IAO) will then simulate the function of the exoskeleton in a virtual factory setting. Based on the simulations results, a prototype of the complete robot structure will be constructed. The development of the mechatronic systems and controls will take place primarily at the Istituto Italiano di Tecnologia (IIT) and the ZHAW. Finally, the system evaluations and laboratory tests will be carried out at the ZHAW and an Italian motor vehicle manufacture’s research centre. A workplace scenario from the motor vehicle industry will be recreated in the lab. The robot structure must be capable of manoeuvring heavy components from warehouse to workplace. French and Romanian project partners in the automotive industry will develop scenarios based on the auto assembly field. These will then be implemented into their production plants. The ensuing results will be analysed, validated and documented so that the data acquired can be used as a benchmark for future research in this area. At the same time, this data will serve as the basis for using this design in other industrial sectors. Throughout the life of the project, experts from the Netherlands Organisation for Applied Scientific Research (TNO) and the Department of Design and Manufacturing Technology at the University of Limerick will be assisting the consortium with the system’s complex ergonomic design. These partners possess, above all, the necessary know how related to labour physiology and user friendly design, which is of ultimate importance for the acceptance of this system in an actual working environment. A German management consultancy is responsible for safety issues relating to the project. After production of the final design, the consultancy will be responsible for ensuring that the end product will comply with the applicable standards in the countries to which it is deployed. To ensure the quickest and smoothest possible integration of the protective robotic aid into the real world industrial setting at the end of the project, a Swiss industrial robot solutions company has also been recruited for the project. Finally, further industry specialists will assist the consortium in the dissemination of the project’s results and take over the administrative support of the EU project, enabling the researchers and industry partners to concentrate on their core competencies. Mechatronic systems play a decisive role in this project and form the basis for the optimisation of individual functions and processes. Without the research and collaboration in the area of mechanics, electronics and informatics, the project’s implementation would not be possible. Small and light yet powerful gear units, new control and regulating concepts, sensors, communication devices, decentralised processor units, energy supply systems, joints with several degrees of freedom and lightweight structural components must be seamlessly integrated. This can only be achieved by incorporating mechatronic concepts from the start of the design phase. The Robo-Mate project incorporates new and already existing technologies in an exemplary and innovative manner. It prepares the path that will lead from today’s industrial manipulators to the intelligent, man-machine cooperation of the future. To accomplish this, flexibility, intelligence and human dexterity are being combined with technical strength, endurance and precision.